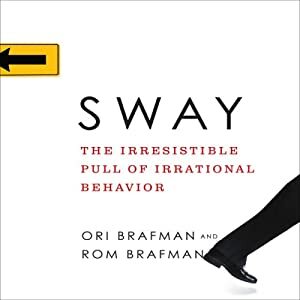 Sway: The Irresistible Pull of Irrational Behavior is a very interesting book. Basically, the book is about why we do certain (re: dumb) things. Brafman brings up a lot of interesting studies (including a few sports examples, which I’ll get to in a bit) and he talks about how we categorize things and people and how we’re biased to our initial diagnosis, even in the face of evidence. The Brafman’s writing is approachable (nothing too jargony) and the book is a fairly quick read (it clocks in at just under 200 pages). In fact, I wish Sway was a little longer and more fleshed out. Brafman tends to jump around (“to better understand problem X, we must first learn about some seemingly unrelated study”) and I could’ve gone for some more info. Staw and Hoang found that the variable most responsible for an NBA player’s time on the court – “above and beyond any effects of a player’s performance , injury, or trade status” – was his draft selection. Even after controlling for all other factors, in a given season “every increment in the draft number [e.g., getting drafted ninth instead of eighth] decreased playing time by as much as 23 minutes.” Incredibly, draft order continued to perdict playing time all the way through a player’s fifth yaer in the NBA, the final year measured in the study. Now remember, Staw and Hoang had isolated draft order from all the other variables. That means that if you have two players with the exact same toughness, scoring and quickness record, the one in picked earlier in the draft would get more playing time, be much less likely to be traded, and have a longer career than his counterpart, who-although he turned out to be just as good-had the misfortune of being picked later in the draft. Let’s pause here. Are Staw and Hoang saying what we think they’re saying? If we think aobut this rationally, once a player is picked, his draft order shouldn’t matter. After all, coaches and mangers should only be interested in a player’s level of productivity on the court and his overall fit within the team. Once the draft is over, the draft number becomes an arbitrary statistic that gives no indication of how he’ll actually perform on his new team. This seems crazy but it kinda makes sense. I’d imagine that a player drafted in the first round is going to get more chances to prove himself or figure it out because he’s been deemed to have “first round talent” (and who knows, maybe he can get even better!). I wonder if draft status affects NFL players in the same way (I imagine it does, but not quite to the same degree). The book is filled with a whole bunch of examples like this. Another interesting idea is that we have the tendency to follow the group, even if we think/know the group is wrong unless someone else speaks up. The thing is, the someone else speaking up doesn’t even have to be right themselves, they just have to speak out against the group (basically make it OK to contradict the masses) and then we feel comfortable doing the same. Anyways, Sway was a fun, quick, read and I highly recommend it. The examples were quite interesting and it really makes you think. This entry was posted in Book Reviews, NBA. Bookmark the permalink.